Dragon Oath Team will bring to you many acttractive and valuable gifts. 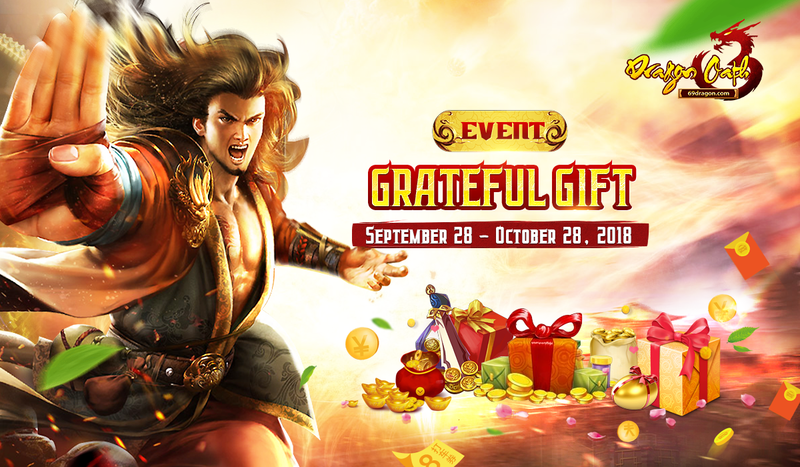 We would like to introduce you the expected event called "Grateful Gift". In this event, we are very happy to tell you that the quality of the present is over millions tokens. Event Time: September 28th - October 28th, 2018 UTC. *Note: The Character who received “Tet holiday present” and Grateful gift in the past, won’t receive at this event. - Create character after January 24, 2017. - Go to NPC at Da Li (151,152) to receive. - During this event, players reach the specified level will receive gift respectively with their level and receive cumulatively (Example: your level is 90, then you can receive gift from 30 to 90). Hope you guys have fun time with Dragon Oath.